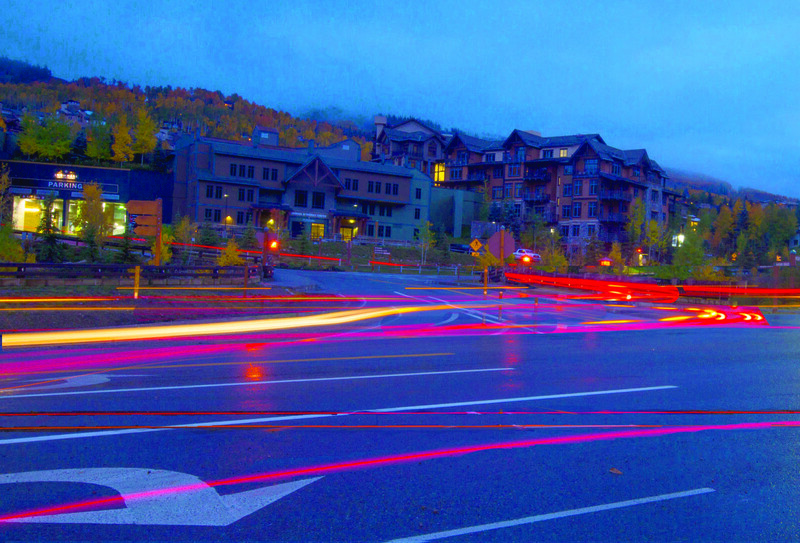 A photo illustration showing cars passing through the intersection of Brush Creek Road and Wood Road in Snowmass Village on Oct. 9, 2014. SNOWMASS VILLAGE — Balancing the needs of a growing resort with the physical constraints imposed in a narrow valley is at the forefront of two transportation projects currently under review. In order to accommodate a new traffic roundabout at the busiest intersection in Snowmass Village, a retaining wall must be built to shore up the steep slope near the entrance to the Snowmass Center. Likewise, if the Aspen/Pitkin County Airport wants to expand its runway layout to meet Federal Aviation Administration safety standards, it will have to encroach upon a city of Aspen open space parcel for a retaining wall. Building on steep terrain seems a given as development swallows many of the remaining flat spaces in the upper Roaring Fork Valley. That includes the section of Brush Creek Road where the roundabout would be sited. To provide a flat bench for the traffic circle requires the road’s approach be made steeper, up to a 10 percent grade at one point. And expanding the upper access to the roundabout at Kearns Road would trigger the need for at least one retaining wall. A view from the intersection that connects Base Village to the Snowmass Center in Snowmass Village. It's a steep place for a roundabout. The roundabout is one of the developer mitigation requirements tied to the 2004 Base Village agreement. 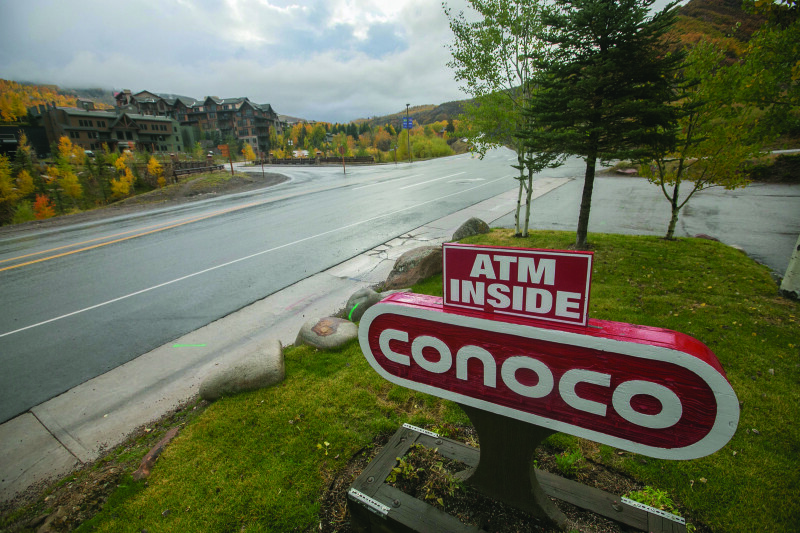 Originally targeted for completion by 2007, the roundabout stalled when Base Village was upended by foreclosure, receivership and finally, reacquisition by Related Cos.
A retaining wall would also be key to the Aspen/Pitkin County Airport’s runway relocation plan that’s currently under public review. A 2,500-foot section of Owl Creek Road would need to be moved if the “Airport Layout Plan” goes forward. Wing spans on the next generation of regional jets that are too wide for Aspen/Pitkin County Airport, along with heightened safety concerns by the FAA, are identified in the county’s Future Air Service Planning study that’s part of the master plan. It includes redeveloping the terminal area, reconfiguring the runway and considering a second private aviation center. Early estimates have targeted the airfield expansion to cost at least $121 million. Key to the new runway layout is utilizing a piece of the Burlingame Ranch Open Space lands that abut Owl Creek Road. “We do try to avoid putting projects on open space. It’s kind of the point of having open space,” said Dale Will, executive director of Pitkin County Open Space and Trails. 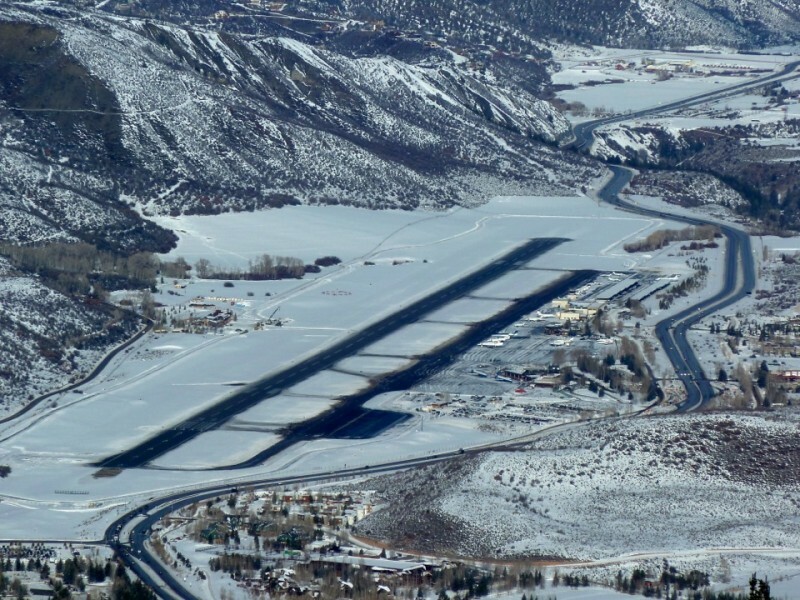 Pitkin County Commissioner Steve Child said there is an option of keeping the runway configuration the way it is rather than moving it 80 feet to the west and widening it by 150 feet. “The consequence would be we can only accommodate prop planes. That would be the choice we would be making if we didn’t want to take a little bit of open space for the retaining wall,” Child said. 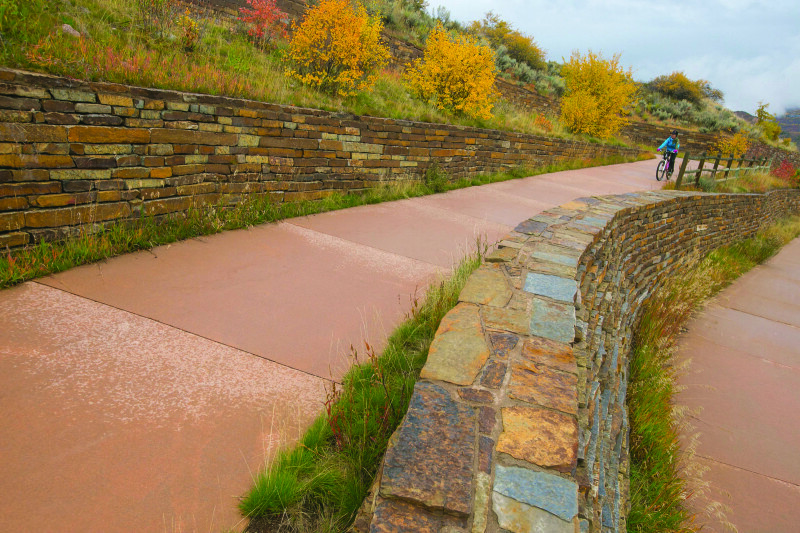 The Snowmass roundabout retaining wall design has evolved to where a tiered approach is now being considered. A new iteration shows it stepping back into open space on the town-owned “Point” site. “The plans submitted include decorative block walls to reduce the impacts to adjacent land via grading. The proposed height of the retaining wall varies between 2-13 feet. We are still in the review process of the plans and reviewing options,” said public works director Martens. Barger of SGM confirmed that if town decides the Point site is best left as a park or open space, then the retaining wall could be significantly smaller than the 20-foot monolith first proposed. But if elected officials prefer to use the land as a parking lot or to satisfy another need (employee housing was once contemplated here), that could require building a more imposing soil nail wall. Pitkin County is just beginning its studies into the feasibility, and public appetite, for the runway expansion project. Brian Grefe, assistant aviation director, said it’s important for the county to continue gathering community feedback. That’s been accomplished through twice-weekly informational meetings hosted by county manager Jon Peacock and outreach sessions between Grefe, colleague Dustin Havel and local community groups. Pitkin County Commissioner George Newman reminded it’s still early in the planning process and that an environmental assessment will outline constraints, limitations and where we go from here. Child sees the runway expansion and the retaining wall as necessary evils if the airport is to keep pace with the changing aviation industry. “I wish we didn’t have to do (retaining walls) at all, except in extreme cases. It means you are cutting into a hill and that has geologic consequences that are permanent,” Child added. Because of that open space takings, the Mills parcel below the park and ride at Highway 82 and Brush Creek Road was acquired and is now being used as part of the Roaring Fork Gorge, the recreational corridor located between Slaughterhouse Bridge and W/J Ranch. Editors note: Reporter Madeleine Osberger is on the Government Desk at Aspen Journalism. This story was done in collaboration with the Aspen Daily News, which published it on Sunday, Oct. 12, 2014.